The problem of designing optimal controllers for linear systems with a limited number of output measurements available for control implementation has been an area of active research for many years, for example (Levine and Athans, 1970; Ermer and Vandelinde, 1973; Mendel, 1974; Kurtaran, 1975; Halyo and Broussard, 1981; Shapiro et al. , 1981; Harkara et al. , 1989; Gajic et al. , 1990; Qureshi et al. , 1992). The problem is defined as one in which the design engineer does not have a full set of state variables directly available for feedback purposes. The control engineers in such cases have two options: either to build the Kalman filter (or Luenberger observer) or to use the output feedback control. Very often it is not desirable to feedback all state variables in a complex system such as an aircraft. The design of the Kalman filter requires the dynamical system of the same order as the system under consideration. That might be costly. The output feedback control as the other alternative is much more convenient from the implementation point of view. 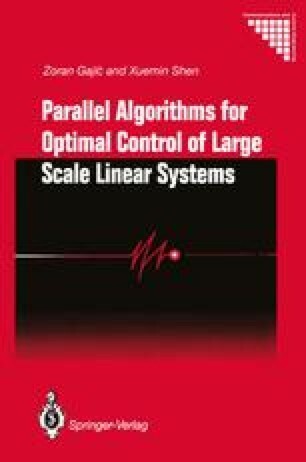 This chapter develops the recursive reduced-order parallel algorithm for the solution of the static output feedback control problem of the quasi weakly coupled (Skataric et al. , 1990) discrete stochastic linear systems (Hogan and Gajic, 1992) and singularly perturbed discrete stochastic systems (Qureshi et al. , 1992).